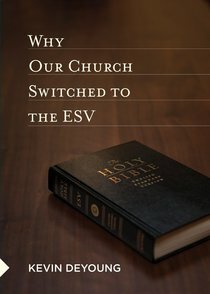 About "Why Our Church Switched to the ESV"
Kevin DeYoung is the senior pastor at University Reformed Church in East Lansing, Michigan, across the street from Michigan State University. A graduate of Hope College and Gordon Conwell Theological Seminary, he serves on the executive team of RCA Integrity, a renewal group within the Reformed Church of America. DeYoung is coauthor of Why We're Not Emergent and Why We Love the Church: In Praise of Institutions and Organized Religion. He has also written Just Do Something: A Liberating Approach to Finding God's Will.